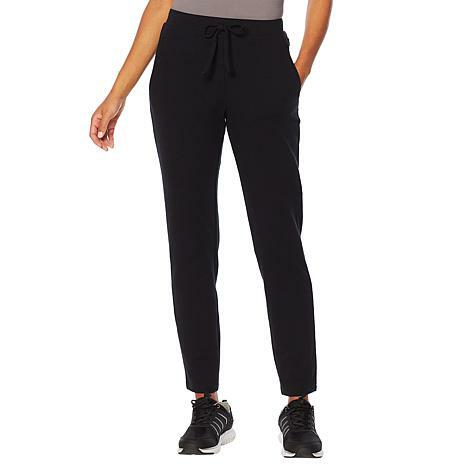 More polished than a sweatpant, this French terry jogger has a slim leg for a flattering silhouette. A full elastic drawstring waist provides the comfort and ease you crave. I wore these pants for physical therapy and then went shopping for the day. Very comfortable and did not wrinkle. 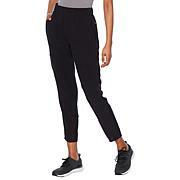 Fabric is very soft and looks very smooth unlike other jogger pants. Would purchase again. Nice color, pockets and length. Fabric was soft enough too. Waist band was just way too thick. heavy, and too big for me (medium). Soooooo bulky when draw string was used. Returned. I thought the material was harsh feeling and these were supposed to be joggers and fit like a legging. All women cannot wear leggings and skinny pants. Just didn't like sent back.